The words in DFW’s dictionary. – Condalmo. The words in DFW’s dictionary. 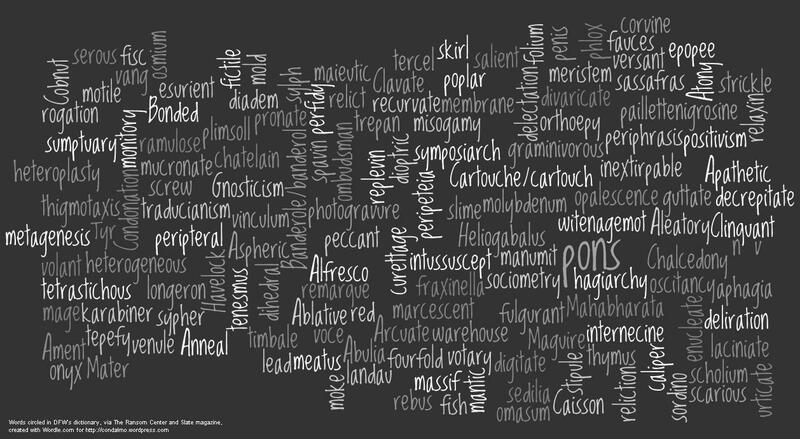 Slate.com ran an article yesterday – well, a list – of all the words David Foster Wallace had circled in his dictionary. (American Heritage Dictionary.) The list was provided by the Harry Ransom Center at the University of Texas-Austin. I’ve taken it and put it into a cloud form, which (I think) looks a little bit better. Click below to have a look. Previous PostPrevious Road trip with David Foster Wallace.